Abraham Lincoln understood that in order to advance Republican principles of limited government, personal responsibility and fiscal restraint it was fundamentally necessary to organize political support at the local level. 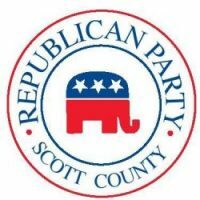 The Lincoln Club of the Scott County Republican Party raises resources to support the operations of the Scott County GOP for the benefit of local Republican candidates and campaigns. Members of The Lincoln Club make an annual donation to the Scott County GOP to build and maintain GOP political infrastructure and win elections. Make your most meaningful investment in Republican principles and campaigns. Join the Scott County GOP Lincoln Club or renew your membership today and together we will celebrate great Republican election victories. Each Lincoln Club membership includes two (2) persons in the same household. Please add both names (if applicable) when ordering. You may download and print a PDF of the membership application form here. Online Lincoln Club memberships payments can be made using the PayPal option below. For more information call 563-823-5854.